Veggie sushi is one of my “me” foods. I’m the only one in the house who really enjoys it with the exception of A who use to go on sushi lunch dates with me weekly but now is hit or miss on weather she likes it or not. One thing that is always lacking is enough wasabi! Even though I can’t count the number of times I put too much on and really feel it I keep going back for more. Hummus wraps are another thing I eat a lot of when trying to use up a batch of hummus I make or buy especially when it’s a kind that nobody else will eat but me. Recently I fell in love with Sriracha hummus, it’s so good! Paired with fresh veggies or my favorite Way Better Sweet Chili Tortilla Chips and I find myself lacking self control. I set out to make Sriracha hummus but got a craving for veggie sushi and ended up making Wasabi Hummus. Yes this happens frequently. It’s kind of like when you go to Target to buy zip loc bags that are on your child’s school list and you end up with a cart full of apple and pumpkin stuff. Don’t even get me started there we ended up with Pumpkin Swirl Bread, Caramel Apple Bread, Apple Pie Bagels, Pumpkin Yogurt, Cranberry Apple Yogurt, and Pumpkin Spice Latte M&Ms and still didn’t get the bags. So we went back the next day and got distracted when S found Caramel Apple Oreos and Pumpkin Chips (like chocolate chips) and I got a phone call and again forgot the bags! I don’t dare go back I’m sending the hubby, it has just been one of those weeks. Ok so back to the Wasabi Hummus! I heard that you get a creamier hummus by cooking the chickpeas so I tried that and it turned out so good! 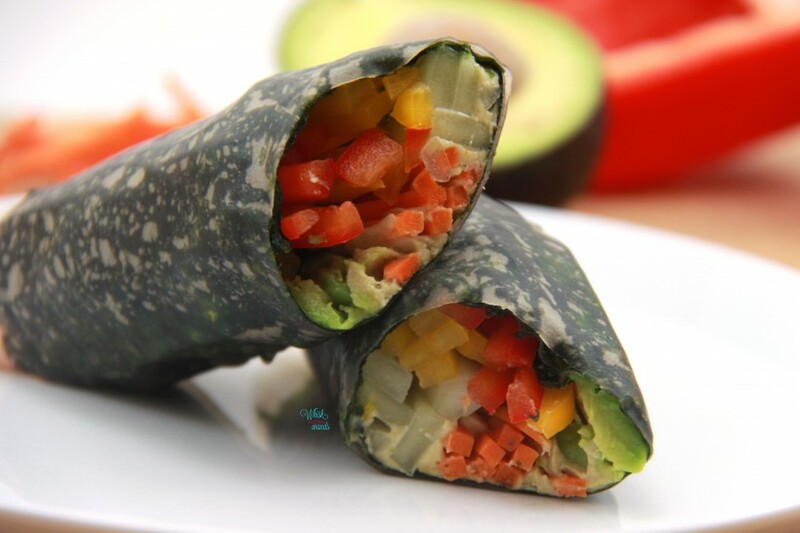 While this hummus is delicious with veggies, chips, or pita bread it makes an amazing veggie roll/wrap! 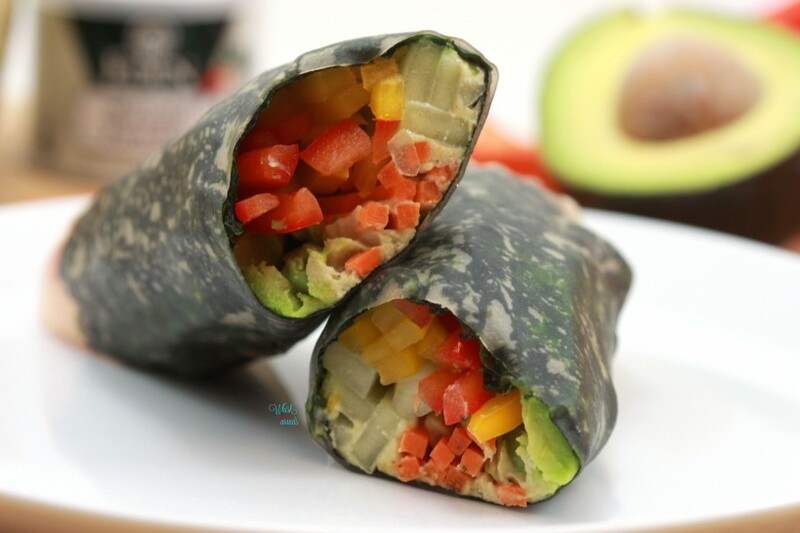 The version I am sharing with you is my favorite, wasabi hummus and veggies rolled in seaweed and brown rice spring roll paper! I also made it using sprouted tortilla wraps but there is just something about this version that leaves me completely satisfied yet wanting more! I think because to me is tastes more like sushi and less like a sandwich and the veggies and hummus are front and center. 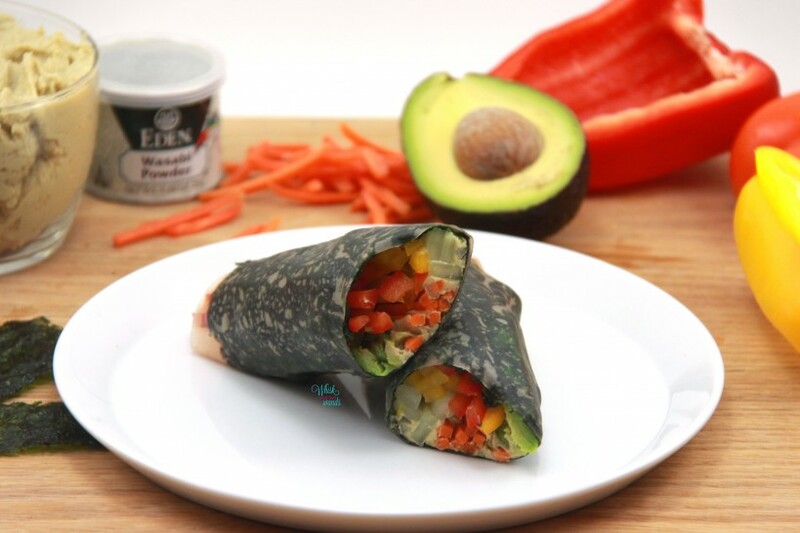 This wrap is sure to leave your taste buds dancing from all the flavors! Perfect for Meatless Monday or any day of the week! Place chickpeas and liquid into a microwave safe bowl and microwave for 4 minutes. Carefully pour the chickpeas and liquid into a Vitamix, or food processor, and blend with tahini, lemon juice, and sea salt until smooth. Add wasabi powder and stream in oil. Refrigerate until chilled, the flavor will be more intense when it cools so cool before adding more wasabi powder if desired. Store in an airtight container in the refrigerator and enjoy within a week. Enjoy! To make Wasabi Hummus Roll shown soak spring roll paper if using in water to soften. Lay softened spring roll paper or tortilla on a plate or flat surface and top with sea weed. Spoon on and spread wasabi hummus, arrange vegetables off center from the wrap and roll. Enjoy! Aww I missed you too but loved following along on your happily ever after journey. 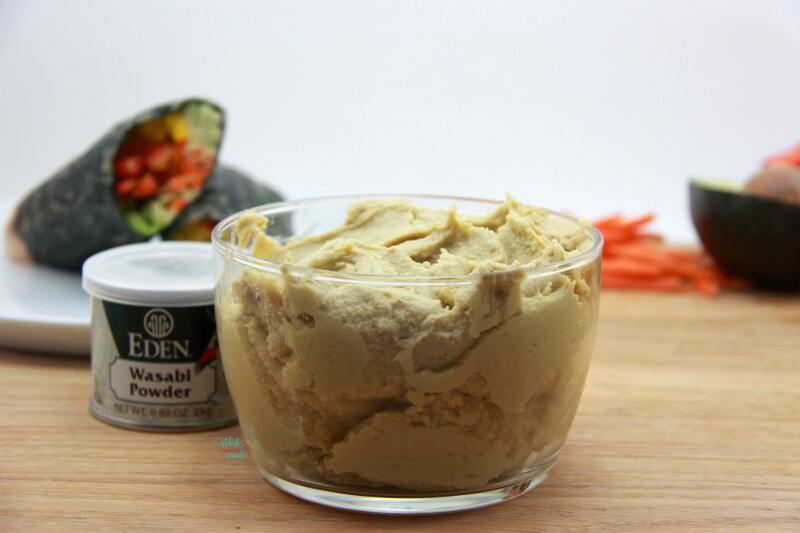 Yes Wasabi Hummus is a must try! They are with the other spring roll papers at Whole Foods, you will have to check them out! Same area I get the full sheets of roasted seaweed. Wasabi Hummus is so good! We will definitely have to get together some day! I’m not big on sushi and never understood why so many people love it, but these rolls are simply perfect! I always see that wasabi powder at the store, but haven’t tried it…yet! Aww thank you! I love veggie sushi as they are so much lighter and more flavorful than a wrap or sandwich and love the wasabi and ginger. It is always just so fresh and full of flavor, I guess I can’t really describe it but it is definitely one of my favorite lunch treats to grab! You will have to pick up the wasabi powder, I bet there are so many other things to do with it. I have only made this and wasabi paste for other sushi wraps or my Deconstructed Sushi Salads. 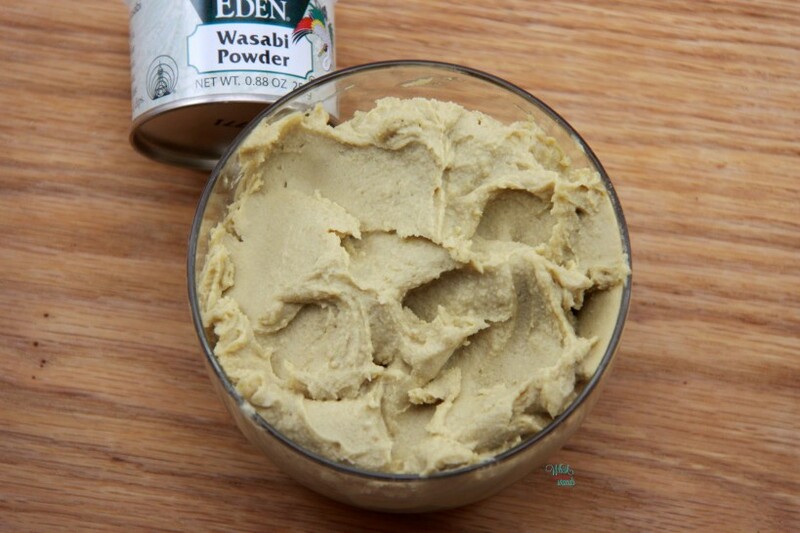 I’ve made wasabi hummus with fava beans, but it was seriously have to try this!! I love these wraps!!! I will have to give it a try with fava beans. Wasabi hummus roll?! Yes, please! Looks so yum! I hope you love it as much as I do when you try it! Yum! I’m not a huge fan of wasabi (too spicy for me), but I think that if it was in hummus the chickpeas would definitely cool it down. I’ll have to give it a try! Maybe start with a little less if you aren’t a fan of it. In hummus it does tone it down but there is still a little bite. Definitely full of flavor! You will have to let me know what you think if you try it! Wow – this sounds absolutely AMAZING!!! Rachel @ A Forever Change recently posted…Fall into Fashion with prAna! Thank you! Yours looks delicious too! I’m actually usually not the biggest fan of wasabi (I’m a wimp when it comes to that), but maybe I’d like it more in hummus form…because these look absolutely amazing! <3!! Thank you! 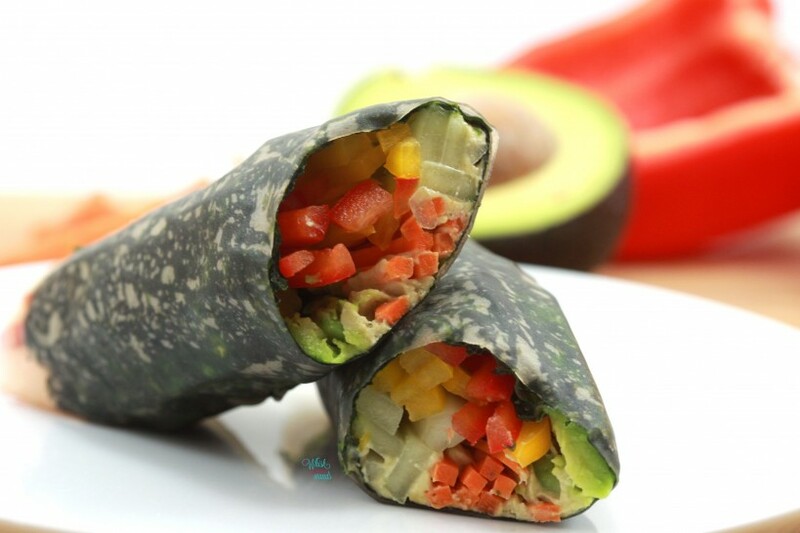 You could always use less Wasabi for just a little flavor or sub in your favorite hummus into these wraps!